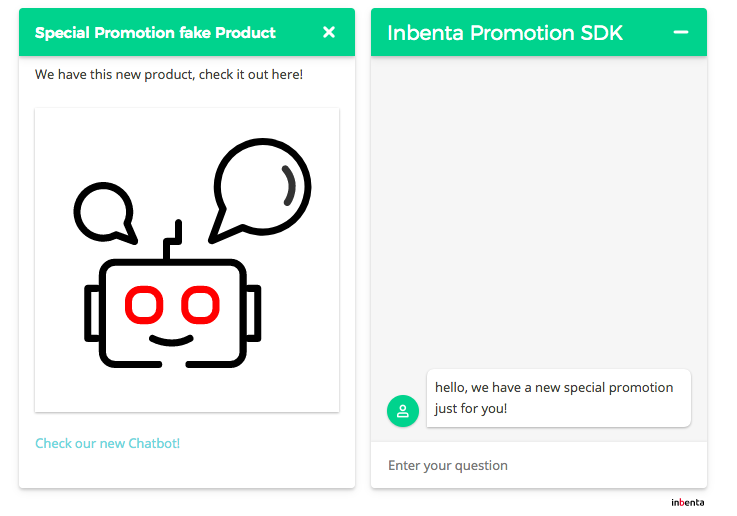 In this scenario, we have a new product, and we want to present it to every user that interacts with the Chatbot SDK. We will show information about this new product in the conversation window, and we will open the side window with an image and a URL so they can see all the information. The first step is to build the adapter. To follow best practices, we build it in an external js file. Every time the showConversationWindow action is executed, the subscription will be triggered. The return function statement is mandatory in order to return the adapter function, which must have the chatbot instance, to be able to dispatch actions and run the subscription. The first time, we want the promotion to display, so we build the sideWindowData and conversationWindowData, and we execute both displayChatbotMessage and showSideWindow actions. In future showConversationWindow actions, we will only execute the return next() in order to call the showConversationWindow action, but not display any additional data. Note: Remember that if no next() statement is executed, the actual showConversationWindow action is not executed. With the adapter already build in adapters/product_promotion.js, we can now run the build function in our index.php.